Self-sacrifice is a way of life for RED ALERT, but non-stop fighting with the DECEPTICONS has caused him to doubt his skills as a healer. His vast sensor array, integrated tools, and instincts as a scientist give him an almost limitless capacity for absorbing data. He considers every possible course of action before committing to a plan, which brings him into conflict with the hot-headed HOT SHOT when the pair arrives on the Speed Planet. Change up! 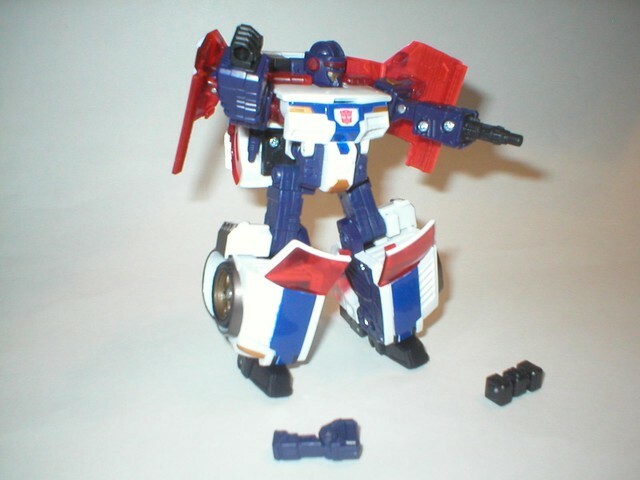 Convert RED ALERT figure from ambulance to heroic AUTOBOT warrior with interchangeable arm tools! Switch back to vehicle mode and use the Earth Planet CYBER PLANET KEY to reveal awesome hidden rotary cannons! Add this figure to your collection and help save planet Earth! Alright, a Deluxe Class Red Alert! Beautiful design. I get to Toys R' Us and find the Transformers are all on sale to help promote the new Cybertron toys so I go nuts and empty out my bank account. Really. I have Powerlinx Red Alert which I didn't know at the time I bought him has all the wrong colors for Red Alert. So I figured that the second I found a Red Alert with the right colors, I'd buy it... so I actually bought this Transformer just for the looks and colors, not for the fact that it's Red Alert. 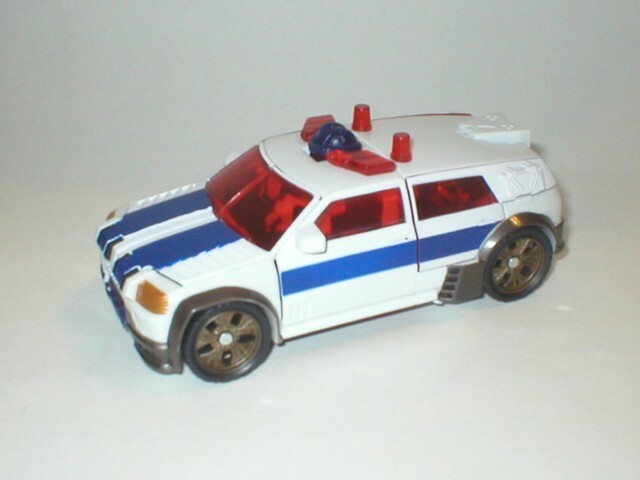 His alternate mode is and always has been an Emergency Rescue Vehicle. In this case he's an ambulance. Nothing like Ratchet or First Aid, he apparently has become a Dodge Magnum. I don't know how long Magnums have been used as Ambulances and I don't much care, because Red Alert looks extremely good in vehicle mode. It's a solid form and cool looking: white, with two navy lines going across it, and red tinted windows to top it off. It doesn't really look like an emergency vehicle, but then again some Transformers require more imagination than others. The only thing that ever caught my eye were the two red pegs behind the flashing lights. What are they, pegs to hold something on? Nope, just another set of flashing lights... Aside from that, Red Alert is a beautiful Vehicle and the Transformer is very well hidden beneath. The head is the only real issue I have, it protrudes more than I'd like it to from the top of the Ambulance -- but you won't notice that at first glance, you actually have to look for it before it annoys you. The whole thing doesn't fall apart like other transformers I have and that's very good. The insertion of the cyberkey makes the back side panels open up and out pop two sweet looking guns. The hard part is flipping the spring loaded guns back in and holding them down while closing the side panel. Once you manage to make him from a vehicle into a robot, you'll notice one thing above everything else: he's really short. I have a good selection of Deluxe class Transformers and he's the shortest, still surpassing all of the regular sized ones (AKA Scout class) but not by much. He's really bulky and heavily armored. As far as poseability goes, the legs are fine and the figure has knees, but if you choose to move them the feet may disconnect and will be a drag to reconnect everytime you bend them. The arms... sigh. At least a T Rex has elbows to go with his small arms. Red Alert doesn't have any elbows, and if you wanna pretend he does, you'll have to pretend that his shoulder is his elbow or that he just has elbows for wrists. He looks great if you put him in a pose, but if you try to play with him (not that I do, but I have to take other people and kids in consideration) you'll notice this fact immediately. Aside from that, excellent facial construction, looks exactly like he should. All in all, great robot form. Special features include the cyber key which once again opens up the side panels to reveal two hidden guns that pop open -- onto his shoulders this time. Although they are hard to see behind the doors he has on his shoulders, they are a cool looking addition. The legs also open up to add a special item to his robotic hand (Legend has it that it was destroyed by Starscream once and the unsalvageable hand was replaced by a multi-function tool.) You have the choice of adding a hammer or a robotic claw to hone his abilities as a healer. This is a beautiful Transformer, I can't say it enough, nothing about him is half as disappointing as anything on Thundercracker. The colors suit him, the form is good in both way, and he looks a lot like his character on TV, which is what kids want to see. Transformation: 6 - You have to do it in the right order or else nothing will budge. Fun: 7 - I'd have loved this as a kid. Price: 9 - Good addition to a deluxe class sized collection. Overall: 9 - Lovin' it. Well worth the Deluxe Class price and I wouldn't call it a collection without him.